In Oaxaca, we met with Educa and Consorcio Oaxaca, both of which carry out a large breadth of work. 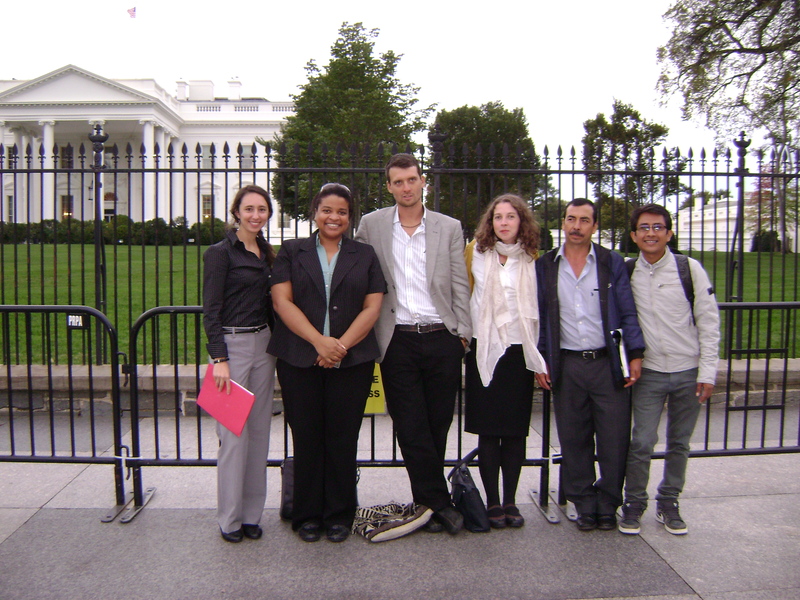 With Educa, we were able to reconnect with Neftali Reyes Mendez (pictured on far right in photo below), who participated in a 2014 speaking tour that brought together human rights defenders in Latin America with communities fighting resource extraction in southern Appalachia. Educa assists indigenous organizations and communities demanding their rights, promotes citizenship education, trains indigenous authorities, and supports local sustainable development projects. It seeks to improve quality of life for Oaxaca’s marginalized communities through the promotion of justice, equality and civic participation. With the entry of megaprojects into the area, in 2006 Educa began to focus on supporting communities in resistance to megaprojects, such as hydroelectric dams and mining projects. In Oaxaca, land and territory rights defenders are coming under increasing attack. In a range of publications, including the daily newsletter La Minuta, which can be requested in English, as well as in a biweekly radio program, Educa chronicles the ongoing struggle for rights in Oaxaca. According to Educa, attacks on human rights defenders in Oaxaca have increased significantly in recent years, both in terms of the frequency of attacks and the level of violence used. Educa members, for their part, have suffered harassment, threats and defamation. Due to its risk situation, as well as the risk faced by the communities it supports, PBI started accompanying Educa in 2013, although collaboration between the two organizations goes back to 2001. We also met with Consorcio Oaxaca, a feminist organization that promotes women’s rights and gender equality by supporting the creation of citizens’ networks, educating women on their rights, and carrying out a series of activities, including courses on gender equality, legal representation of women victims of violence, documentation, protection of women human rights defenders, publication of reports, street protests, and community work with women from the Mixe region. Consorcio also runs a retreat house for women defenders suffering from burn out and stress related illnesses, where they are treated with traditional medicine and supported in ways that will strengthen their work. In addition to the retreat house, Consorcio runs a safe house for women at risk that takes into account their full range of needs. Consorcio has recently begun working more broadly to support defenders struggling to defend their rights against an array of impositions, from megaprojects to educational reforms. One group accompanied by Consorcio, the Committee for the Defense of Indigenous Peoples (CODEDI), has been the target of extreme repression this year: five CODEDI members have been extrajudicially executed. Due to their work, Consorcio staff also have suffered surveillance, threats, and harassment, including eleven break-ins to offices and members' houses in the last seven years, in which documents and computers were stolen and other objects of value left behind. PBI-USA helped put Consorcio director Yesica Sanchez in touch with the Inter-American Commission on Human Rights so that she could explore protective measures for those individuals and groups most at risk. Consorcio's work includes pressing for the release of thirty political prisoners. Consorcio staff spoke to us in particular of the cases of Enrique Guerrero and Damian Gallardo, both imprisoned on false charges since 2013, although the UN has recognized them as human rights defenders who were arbitrarily detained and tortured. Enrique, a university student at the time of his arrest, has been teaching philosophy to his fellow inmates at the high security prison where he is detained. Damian, a teacher, has published a collection of poetry from prison, with the help of the World Organization Against Torture, which published the volume, and Consorcio, which has helped publicize it. Mexico's president-elect, Andres Manuel Lopez Obrador, has promised to grant "amnesty" to political prisoners, and Consorcio and many other advocates throughout Mexico are hopeful that those falsely accused will soon be released. PBI has accompanied Consorcio Oaxaca since 2016. 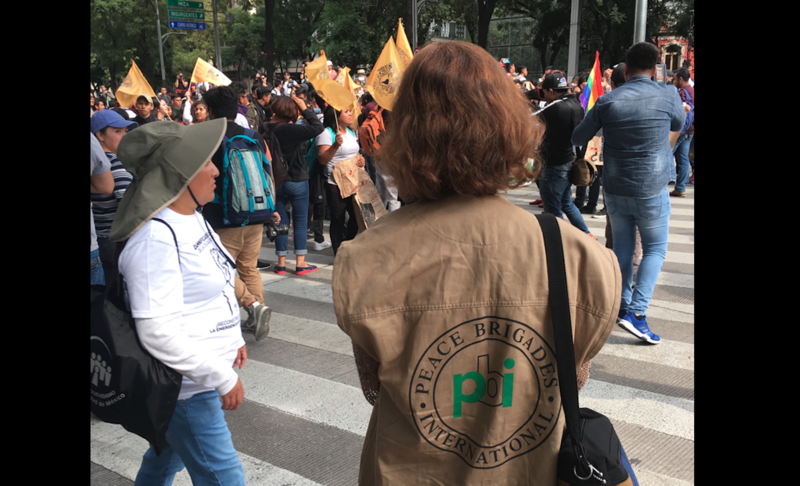 Next, we headed to Mexico City, where we obtained a thorough understanding of PBI Mexico's coordinating office, which coordinates work between PBI's northern and southern teams in Mexico. The Mexico City office was working on organizing the production of a video on large-scale development projects; responding to two emergency situations, one in the north and one in the south of the country; and finishing a joint report, with the Washington Office on Latin America, on strengths and shortcomings of the Federal Protection Mechanism. Pictured below is a portion of a powerful mural painted on the wall across from the Mexico City office that reads "My body is not a battlefield." The following day, we met with the Cerezo Committee, an organization that PBI has long accompanied, which works for the defense and promotion of human rights, especially of those who have suffered political repression. The Cerezo Committee was established after the 2001 arrest, torture and detention of brothers Alejandro, Héctor and Antonio Cerezo Contreras (Antonio is pictured on the left in the photo below). They were held in a maximum-security prison under false accusations of being responsible for placing explosives in three branches of a bank and being members of the People's Revolutionary Armed Forces. Siblings Francisco (Pictured on the right) and Emiliana then formed the Cerezo Committee to advocate for their brothers’ release. In 2005, Alejandro was released and four years later, Antonio and Héctor were freed. They pledged to continue working for the release of all political prisoners in Mexico. Today the Committee is one of the leading organizations documenting human rights violations, particularly of human rights defenders, in the country. Following several episodes of harassment and threats against Francisco and Emiliana, PBI started accompanying the Committee in 2002. The Inter-American Commission on Human Rights issued precautionary measures for Francisco, Alejandro and Emiliana in 2006; however, the measures have not prevented continued attempts to criminalize the brothers and restrict their movement. We were also able to meet with the National Human Rights Commission as PBI México staff shared concerns regarding the security of PBI-accompanied groups receiving federal protection measures. The Commission is a public institution with judicial, organizational, and functional autonomy from the federal government. The mandate of the Commission is to protect, study, and disseminate the human rights protected by the Mexican legal system. Before leaving México, we were fortunate to be able to witness the annual march organized to commemorate four years since the disappearance of the 43 students from the rural college of Ayotzinapa and keep pressure on the government. On September 26th, the day of the march, the parents of the disappeared students met with President-Elect Andrés Manual López Obrador to talk about the case, their frustrations, and specific requests for the new administration. The government declared their commitment to the case and to the inclusion of international entities to help identify those responsible. The current government of President Enrique Peña Nieto continues to insist on its own version of events as the “historic truth,” despite the huge quantity of evidence against it and the constant pressure from civil society and international entities such as the UN (see their 2018 report "Double Injustice"). Background: On the night of the 26th and the morning of the 27th of September 2014, 43 students from the rural college of Ayotzinapa were forcefully disappeared in Iguala, Guerrero. They were part of a group of students that were heading to Mexico City to take part in protests commemorating the massacre of Tlatelolco. To this day, the Mexican State has failed to investigate the whereabouts of the students, establish those responsible and punish them. PBI stands in solidarity with all those searching for their family members, coming up against unbearable impunity with strength and inspiring dignity. Next, we continued on to Guatemala, where we pursued another full week of meetings with accompanied groups and individuals. To strengthen our understanding of the current contex, we met with longtime human rights advocate Claudia Samayoa, founder of UDEFEGUA (Unit for the Protection of Human Rights Defenders in Guatemala). From Claudia (pictured below), we gained greater insight into the events leading up to and following the decision by Guatemalan President Jimmy Morales to bar the reentry into the country of the head of the International Commission Against Impunity in Guatemala (CICIG), Ivan Valesquez. UDEFEGUA’s offices were among those surrounded by military vehicles following the President’s announcement. UDEFEGUA describes the President's actions as a coup, given that the Constitutional Court had previously ruled that the President lacked the authority to expel Velasquez from the country. President Morales has stated that he will not obey any "illegal order" from the court. Claudia explained that the year-long clamp down on civil society and spaces for civic engagment, which began with Morales' effort to expel Ivan Velasquez in August 2017, is continuing, but the White House has not taken a strong stance in support of democracy or anti-corruption efforts. She expressed concern that with next year's presidential election, attacks against defenders, already numbering twenty-one this year, will increase. The evening brought an opportunity to spend more time with PBI’s team of field volunteers in Guatemala. The field team has a wide and rugged terrain to cover and they show up for the challenge enthusiastically. The 11, soon to be 12, volunteers share a living space that also serves as the Guatemala City office. During our visit, the team was working on a new home for the hundreds of publications that lined the walls in addition to their daily visits, meetings, phone calls, report writing, alert issuing, household chores and cooking duties. The following day we met with our partners at the Guatemala Human Rights Commission and the Human Rights Defenders Project, for further updates and analysis. They confirmed Claudia Samayoa's concern that repression against defenders in the coming year would increase. In their opinion, the increase in defender killings this year, along with repressive legislation in Guatemalan Congress, is part of a very well-coordinated plan to attack human rights defenders and all their support structures. Pictured below, Amelia and Pat meet with Robert Mercatante, Human Rights Defenders Project and Isabel Solis, Guatemala Human Human Rights Commission. Following our morning meeting, we had such a lovely lunch with longtime PBI volunteers that we forgot to take a picture! Maripaz Gallardo de la Torre and Eva Scarfe joined us for the afternoon to share their reflections on PBI’s work as well as the current threats facing human rights defenders in the country. Although there was tremendous concern for the rate of killings of human rights defenders, Eva shared her assurances that her experience (of which she has plenty after her 80+ years on this earth and 30+ years in Guatemala) informed her that a state of emergency was not imminent in Guatemala. The power and resolve exhibited by the people of Guatemala during the Presidential scandals of 2015 is still present and it will prevail, she shared. Maripaz and Eva both serve on the project committees for Honduras and Guatemala. Click here to read an interview and view photos of Maripaz from 10 years ago conducted by former PBI-USA co-director, Barbara Wien. Click here to read a story about Eva told by former Colombia field volunteer, Scott Pearce. After a few days in Guatemala City, we set off to meet with members of the Peaceful Resistance of Cahabón, an organization working to defend their rights in the face of the construction of two hydroelectric dams on the Oxec River in Alta Verapaz. More than a hundred communities are affected by the construction, which has diverted the river. To reach Cahabón, we had to travel from Cobán over bumpy, dirt roads next to sheer cliff drops. It truly is a beautiful part of Guatemala with rolling hills and the ever-present cloud forest that served as a constant reminder of how precious the ecosystem was in the area. We were lucky. 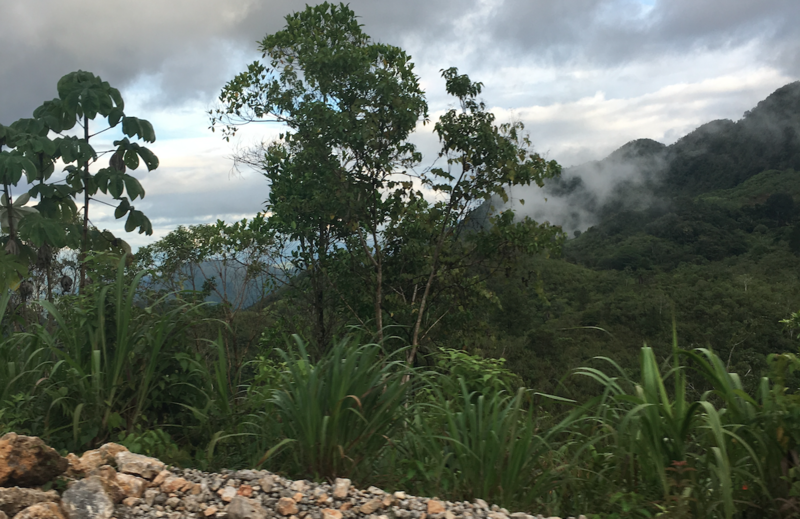 We traveled with a PBI staff member who has a 4-wheel drive vehicle and drives confidently across the rugged terrain after having lived in Guatemala for close to 15 years. She is the only PBI staffer in the country with a vehicle. The volunteers all take public transit to visit defenders, often standing in the back of pickup trucks, bracing themselves on the rack attached to the back of the cab. At our meeting in Cahabón, we were able to reconnect with Raul Caal, who had participated in PBI-USA's joint speaking tour in Washington over the summer, visiting fourteen congressional offices, as well as the State Department and the OAS. We were moved by the commitment and hardship we witnessed, and by the courage of those fighting, at the risk of their own safety, to preserve their environment and their way of life. After leaving Cahabón, we stayed in Cobán to meet with a group that has suffered tremendous repression, the Campesino Committee of the Highlands (CCDA). Five members of the CCDA have been brutally killed this year and one has been disappeared. PBI recently began accompanying the CCDA during the summer of 2018. The organization works to improve indigenous farmers' lives by seeking global change in social, economic, and political spheres and promoting respect for indigenous culture and rights. The leader of the CCDA's Alta Verapaz/Baja Verapaz office, Lesbia Artolo Teyul (pictured below on the left), let us know that as a result of PBI's accompaniment, CCDA members are no longer getting beat up, do not fear arrest, and are not discriminated against when they go to file a report with the local Public Ministry's office. We had the great privilege also of meeting with Bernardo Caal Xol, an imprisoned member of the Peaceful Resistance of Cahabón, who has been detained since last January awaiting trial on unsubstantiated charges. Bernardo was grateful for our visit and the weekly visits he receives from PBI Guatemala's field volunteers. Click here to read a recent article by PBI Guatemala about Bernardo's case. Over dinner, we spoke with Alex Vasquez (pictured below), a member of Red de Sanadoras (TZK'AT Ancestral Healing Network of Community Feminism from Ixmulew). From Alex, we learned about the discrimination and threats traditional healers face. Women defenders who serve as ancestral healers in Mexico have a history of being politically persecuted, suffering stigmatization, death threats, territorial political displacement and criminalization as a result of their work in defense of the rights of indigenous peoples, women, and the land. In addition to their advocacy work, they work as healers, midwives, herbalists, etc in indigenous communities. PBI began accompanying the TZK'AT Network in February 2018. We headed back to Guatemala City following our visit to Cahabón and Cobán to meet with U.S. embassy personnel and share our concerns, particularly regarding the number of human rights defenders killed in Guatemala this year, a number that continues to rise. We also discussed the use of U.S.-funded military vehicles to intimidate human rights organizations and the U.S. embassy as well as frivolous legal actions taken against human rights defenders for political purposes. We ended the week observing and participating in a security workshop planned for PBI-accompanied defenders. We left the workshop to head straight to the airport, wrapping up an eventful and productive visit to two PBI projects. Thanks to the staff and volunteers who provided support and guidance to our trip and to the human rights defenders who spent time sharing their stories and struggles with us. We appreciate the work that you all do!